ETI0001-2205E2 is being used as a power source in global defense applications because of the stringent performanceand reliability requirements. ETI0001-2205E2 has the added benefit ofhaving a field replaceable battery via front drawout battery module. The external battery connector allows the safe and easy addition ofthe standard or extra battery modules without having to shut the unit down.The batteries are maintenance free with immobilized electrolyte and areconstructed of flame retardant materials. For more information, see the BatteryTechnology section. TheStatus connector provides an interface with optional computer softwareproviding loss of AC and low battery status as well as remote shut downcapability. ETI0001-2205E1 for the standard height version (6U total versus 5U) of this unit that is totally backward compatible. 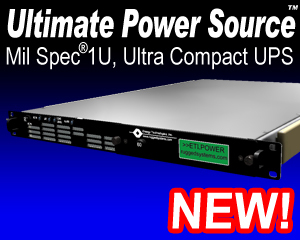 See the Power Distribution Units section for alisting of stand alone PDUs. See the N5 Series section forversions of UPS with an integrated PDU and remote control.